Amazon, you had us at… hello! – 50,000 jobs and a potential $5- billion investment! What city in its right mind wouldn’t welcome a company and its second headquarters, with all those jobs and dollars at stake? Toronto may be a long shot among the 20 final candidates chosen from the 238 proposals from across the U.S., Canada and Mexico to host HQ2. But, wow, wouldn’t it be great? Jobs are crucial to the economy, so adding 50,000 of them of this stature in one city alone? It would be the Powerball of employment jackpots. Quite likely, sources say, you can count on rising rents and property values. However, for a city already struggling with a housing affordability issue, would Amazon coming here actually be a good thing? “Awarding it to Toronto would be a big economic and political win for Toronto. However, at the same time it would make the region even less affordable whether for renters or homebuyers,” says Don Campbell, real estate expert and senior analyst of the Real Estate Investment Network (REIN). Currently in Canada, there are more than 300,000 job openings, Campbell adds, and employers in cities such as Vancouver and Toronto are having difficulty filling some positions. “One reason is the unaffordability of some cities, where workers can no longer afford the rents and purchase prices in these centres. So, even as the economies grow, there is a cap on the number of workers who can afford to fill the jobs. Hence the reason we are witnessing a resurgence in other regions, such as Hamilton, the Niagara Region, Barrie and Kingston, with employers going to where they can begin to attract the workers. “Would it be a fantastic win (optically) for the region? For sure. Would it help the current federal and provincial Liberal governments in their upcoming election bids? Absolutely. Would it become a fantastic economic driver for the area, first for construction jobs, then for these many thousands of operations jobs? No question. 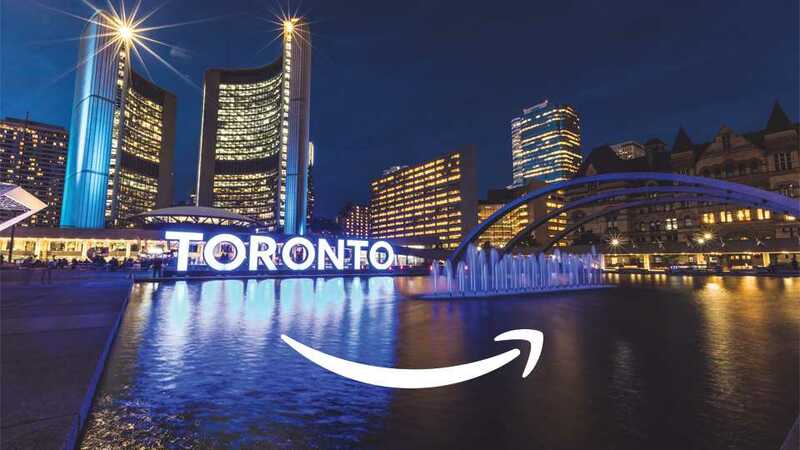 For the housing industry, Amazon in Toronto would put pressure on home builders and government policy makers to make sure they have the right framework to accommodate such growth, according to David Wilkes, president and CEO of the Building Industry and Land Development Association. “The growth anticipated for the Greater Toronto region is going to be significant,” he told NextHome. “There’s going to be many new people moving into the region, many new jobs created, the requirement for new homes and offices, and renovating existing stock, is going to become even greater.